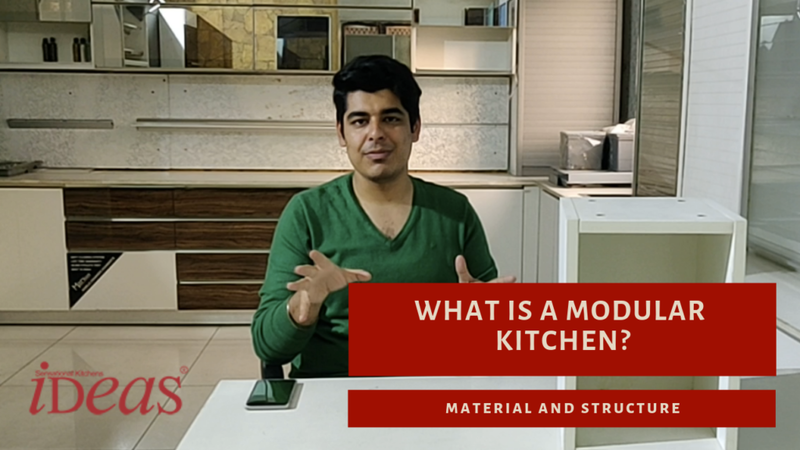 The box structure of your kitchen and the material that is used to make it defines its strength and durability. We will deconstruct the the reason behind the structure of the box, the method used to construct it the consequences of a ill constructed box. The material that should be used to make the module has to be termite resistant, water resistant and have good screw holding capacity. Hence one of the best material to use is laminated 18mm thick plywood. The chemically treated layers of the material ensure that the structure will withstand termite and moisture. The layers provide excellent screw holding capacity to the internal fittings like drawers and hinges. This ensures that the accessories run smoothly and for a longer period of time. The module has five sides. The top, bottom, right and left sides are made of laminated 18mm thick plywood. The back is generally made of water-proof, termite proof and fire proof material like bacalite or WPC. The top provide a flat surface to fix the counter-top without any gaps. The sides provide the partition and strength for better organisation of material and load bearing. The ABS legs are installed on the bottom of the box. This ensures that if there is any water that spills on the ground it does not come in contact with the box. Mini-fix is a type of screw that is used to hold all the sides together. The mini-fixes that are used to hold the sides in the structure of a box are of much superior quality than normal screws.They ensure that there are no gaps in the sides. Any gap in the structure is a possibility of pest and cockroach infestation. The straight alignment of the sides also ensures that all the modules fit together with ease. It also adds to the strength of the box and hence that of your kitchen. The main reason why the boxes get damaged is because of either water seepage or termite. All of this comes through from the walls of your kitchen. Thus to give an extra level of protection the back of the box is made of termite proof, water-proof and fire-proof material. This can either be WPC or bacalite sheet. Further the box is made in such a way that only 10% of the entire box actually touches the walls when they are fixed on the wall. Hence even if there is ant seepage it will not reach your boxes for a long period of time. These are the quality standards that we stick to while we are making modular kitchens and wardrobes for our clients. This ensures that that each box has great load bearing capacity, can be easily cleaned and is durable.